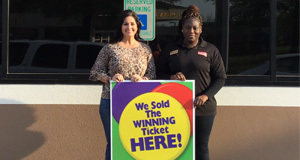 Circle K #2740386 Manager Christie Bogan (right) joins Shreveport Sales Representative Ashley Mandina to show off the store's new celebratory sign, received after selling the Lotto jackpot winning ticket worth $550,000! BATON ROUGE – Eddie Jelks of Shreveport received a welcomed surprise when he checked his Louisiana Lottery Lotto ticket the morning after the March 16 drawing and saw that he won the $550,000 jackpot prize. The 72-year-old’s winning ticket matched all six numbers to win the $550,000 Lotto jackpot prize, which he claimed Monday at Louisiana Lottery headquarters. The winning numbers were 01-10-16-22-23-40. Jelks received $390,500 after state and federal tax withholdings. He plans to put his winnings in the bank. The winning ticket was sold at Circle K #2740386 on Kings Highway in Shreveport. The store received a one-time selling bonus of $5,500, which is 1 percent of the prize.